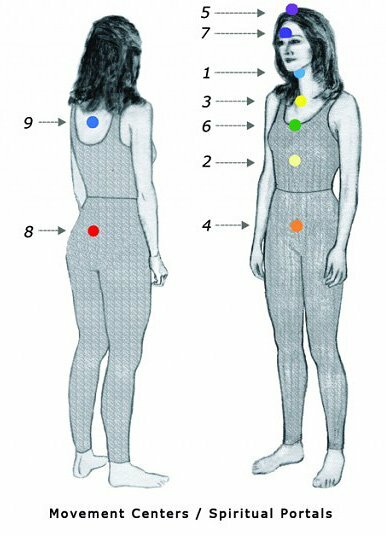 The nine Spiritual Portals also function as Movement Centers. The spiritual energy that comes through a Spiritual Portal / Movement Center shapes the body’s movement in many ways. Some examples of this: the Spiritual Portal is where a person’s movement begins; there is more movement in the area of the most active Spiritual Portal; a person often draws more attention to this area through the use of jewelry or hand gestures. If you have been Soultyped, then you will know which of the nine Spiritual Portals / Movement Centers is the one from where you naturally and easily move. The focus of New Equations training, practices, and education, is to integrate the movement of all nine Spiritual Portals into one’s body. You do not need to be Soultyped to learn to integrate all nine. Moving from all nine Movement Centers is fun to do and requires training offered by the New Equations Advanced Training Organization. We invite you to watch nine videos of people in movement – one video for each Soultype – enjoy!